Keep Your Mouth Shut … Unless You Want to Be a Saint. The Second Tuesday of Lent; and, the Commemoration of Saint Polycarp, Bishop & Martyr. • Isaiah 1: 10, 16-20. • Psalm 50: 8-9, 16-17, 21, 23. The Second Tuesday of Lent; and, the Commemoration of Saint Peter Damian, Bishop, Confessor & Doctor of the Church. • III Kings 17: 8-16. • Psalm 54: 23, 17-19. The Third Tuesday of the Great Fast;* and, the Feast of the Holy Martyr Polycarp, Bishop of Smyrna. • Isaiah 9: 9—10: 4. 9:16 AM 2/23/2016 — The Holy Mass today, as you know, is offered for the repose of Scott Riccio, who worked here for many years. Most of you have been here a lot longer than I have, so I'm not going to mar the moment by trying to tell Scott stories; that wouldn't be appropriate at Holy Mass, anyway. Suffice it to say we offer our prayers for him and his family today as a more than fitting consummation of our nine days of prayer for his soul which concluded on Sunday. 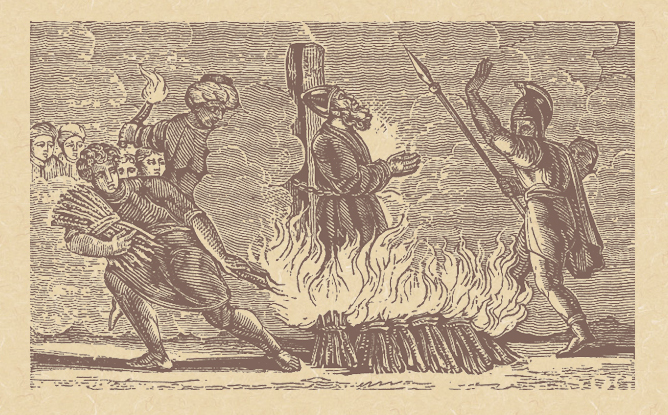 The day is also shared by Saint Polycarp, who has the distinction of being one of the very first martyrs venerated by the Church. We know his name in this chapel because we've mentioned him before with regard to the dating of the Holy Gospels: he's one of a handful of early Fathers of the Church who testifies to the existence of a version of Matthew's Gospel in the Aramaic language less than sixty years after the Ascension of our Lord, far earlier than many modern Scripture scholars are willing to admit. He even quotes from it, throwing cold water on the presumption of the last fifty years that Mark's Gospel had to be written first simply because it's the shortest. He was a close friend of Saint John the Evangelist, and was consecrated Bishop of Smyrna by him, but was also personally known to almost all the Apostles. He went to Rome during the reign of Pope Anicetus, and was instrumental in helping to determine the date for Easter. That's actually a good image of him, because he was known to have a fierce temper, but only when the faith was being challenged. 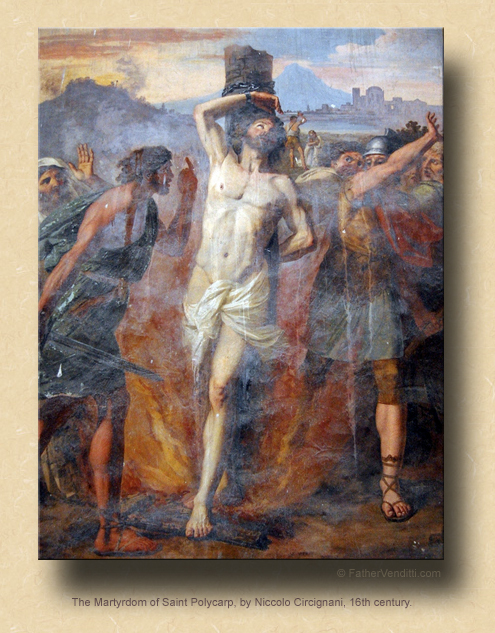 His temper turned out to be his undoing: he was so plain spoken and fearless in the face of heresy that he quickly ran afoul of the Emperor Nero, who had him burned at the stake and, as I said, was one of the first of the early Christian martyrs to be venerated. Which all fits in with the lesson from—of all things—Matthew's Gospel, which is our Blessed Lord's own rant against hypocrisy and “know-it-all-ism.” One could say that Marcion and Valentinus were worthy successors to the Scribes and Pharisees in that they, too, presented themselves as faithful followers of the faith when they were, in fact, only serving themselves. It's important to note—and we've mentioned this before—that our Lord doesn't challenge the authority of the Scribes and Pharisees; quite the contrary, they sit “on the chair of Moses,” says our Lord, and charges His followers to “observe all things whatsoever they tell you, but do not follow their example” (23: 2-3 NABRE). That's an important distinction for all of us. How often do we find ourselves griping and moaning about the Pope, about the Bishop, about our parish priest, or even the Shrine Chaplain;—what a warm and fuzzy individual he is—but, we always, thank God, manage to stop ourselves because we know that we're all in the same boat. We're all human, and each one of us can only perform according to his or her gifts. And this is self-evident in every aspect of life, not just religion. We get annoyed with our spouses, we get annoyed with our kids, we get annoyed with our parents, but that doesn't mean we don't love them. It means we're all different; and, thank God for that, otherwise this world would be a very boring place. Think back to the quote I gave you from the Rule of Saint Bruno on Ash Wednesday: we've got enough of a job purifying our own souls; we don't need to be policing everybody else's. Come now, let us set things right…. Though your sins be like scarlet, they may become white as snow; Though they be crimson red, they may become white as wool (1: 18 NABRE). * Inasmuch as the Great Fast begins on the Monday after Cheesefare Sunday in the Byzantine Tradtion, today is the third Tuesday, not the second.